Filed to: Death Inc.Filed to: Death Inc.
Death Inc. is an upcoming strategy game where you play as Death. Not the badass one like you see in Darksiders. More like, the one who's running his business from the basement of his gran's house. We Are Going To Play As The Grim Reaper. And Spread The Bubonic Plague. It's a quaint setting, especially when you consider the fact his "business" - and the aim of the game - is dispensing the deadliest plague this planet has ever seen, but it's not what's really winning me over. What's doing that is the game's art design, which is all bubblegum colours and painstaking attention to detail. Nowhere is the latter more evident than in the way Ambient Studios, made up mostly of ex-Media Molecule (LittleBigPlanet) devs, went about designing the player's "home". Instead of just whipping something up in PhotoShop, their lead artist Jon Eckersley actually went out and built a scale model of the thing. "Building a physical model forces you to not only work to an art style, but everything must practically function as well", Eckersley tells us. 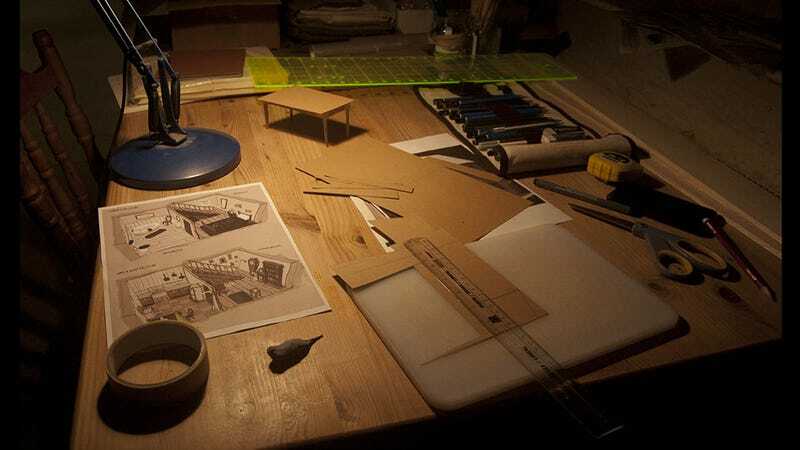 "You can cheat a fair bit with a 2D concept, but you definitely can't when you're making it out of wood and card - that forces you to make a lot of design decisions. Those choices directly feedback into the game and sit sloshing about in my head when I'm making actual game assets - how far can I push this without breaking things? It makes the world our characters are living in really believable." That's a pretty common thing to do with movies, and also when designing, say, a character or vehicle, but a house? To become Death's doll house? That's pretty cool. The images you can see below are of the house Jonny built. The team have also made a demo for the game available here; it's fairly basic, and very early, but it does give you an idea of the mechanics the game will be using.